Aspiring trombonists can practice their craft without even picking up the brass. 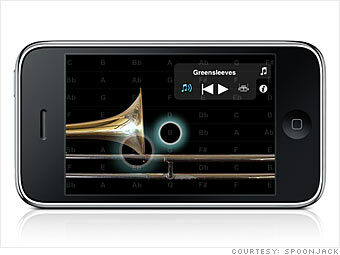 The iBone lets you learn scales and play along with songs in your iTunes library. Just touch the iPhone display or blow into the microphone to make a sound, and slide your finger to change the pitch. If you're stuck, try a tune from the very limited iBone songbook and have the "roboBone" play it for you.